The Wheel of Life is a great exercise and tool for helping you create more balance and success in your life. It is often used in coaching and is a great foundation exercise when goal-setting. Below, you can download the free wheel of life template which is used by more than 3,000 people every month. find balance in their life and take action for making change. Below is a quick video I put together to explain how to use the Wheel of Life. Welcome to your Wheel of Life! As a starting point for creating balance, happiness and success in your life, the Wheel of Life is the perfect tool to begin your journey. Using this tool, you will be able to reflect and gain some insight into the balance of your life and how satisfied you are in life’s different areas. Following on from this self-reflection, you can utilise this exercise to further delve into why your wheel of life looks the way it does, what you would like your wheel of life to look like, and further into how to make this happen. This Wheel of Life Exercise is not to be confused with the Buddhist Wheel of Life. The Wheel of Life used in Buddhism focuses more on an awareness of your mental state. In our Wheel of Life that is commonly used in coaching and goal-setting, it’s purpose is to identify how you’re currently spending your time and how satisfied you are in the different categories of your life. Before we get started, this post has a supplementary tool which can be found in the Success Starter Toolkit. Enter your details below to gain access to the Success Starter Toolkit and download your free Wheel of Life templates, guide and action plan. 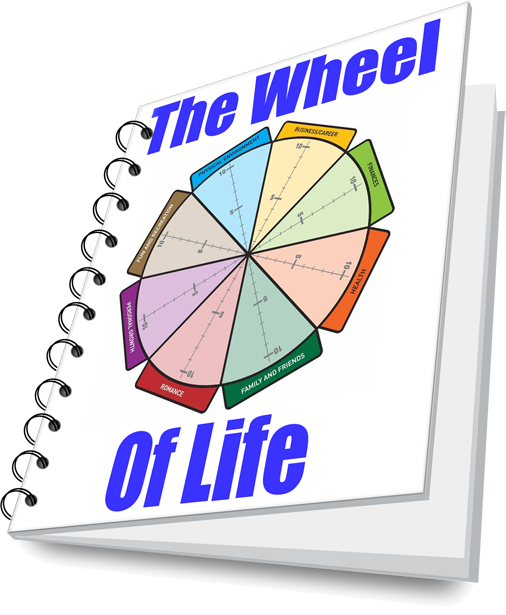 Download the Wheel of Life Template Now! Enter your name and email address and I will send you the Wheel of Life template and exercise immediately to your inbox. Remember, this is about you finding happiness and balance in your life so it will need to be clear and simple for you to understand. Now that you understand the building blocks of the Wheel, let’s go ahead and actually complete it! Print off one of the above Wheels to use as a template, or simply draw your own on a piece of paper. To download the free wheel of life templates, please access the Success Starter Toolkit. For example, you can spend all your time and energy working on your career and make some fantastic progress. Perhaps you will even become extremely satisfied with your finances and wealth. However, what may happen to your relationships? Your health and well-being? Are you having fun along the way? The key is to find the balance and that is the beauty of the Wheel. To do this, you want to grow your Wheel, not balance your Wheel by trading off in some areas of your life. It’s about moving forward, challenging yourself and pushing your boundaries to expand your Wheel and make it bigger while maintaining a balance. The Wheel of Life exercise is the perfect starting point for goal-setting and this is why so many life coaches, career coaches and executive coaches use it as a tool. Get access to the Success Starter Toolkit and download the Wheel of Life templates, supporting guide and action plan. Enter your first name and email address below and I will send you the Wheel of Life exercise straight to your inbox. How was your Wheel of Life? What sticks out for you? Is there anything that jumped out at you that you didn’t not realise in your life? Do you know what you need to do create balance or expand your Wheel? Share your thoughts and comments below! I look forward to the conversation! While I certainly understand the intent of a tool like this, which is to take a thoughtful look at your life as a starting point to make changes, it falls short of the desired impact, in my opinion. The major aspect I see missing is an exploration into the beliefs going on behind a particular person’s answers to the questions. What is the rules behind their answers? In general, when we have lop-sided life wheels, it is often because we are compensating for feeling powerless in other arenas of our lives. I think this exercise could be even better if you built in strategic questions that helped the user imagine new behaviors that could empower them to make change. Let’s start with the assumption that each person’s life is in it’s current state because the perceive they are doing the best they can. Add in another step that asks the user to pick one area they would most like to improve, and then lead them through a separate exercise to imagine new possible solutions. Perhaps you have this step elsewhere in the many free (and generous) offerings in this website, but by not including a link to it here, this exercise falls a bit flat for me. This tool could be a homerun! I like your thinking and I completely agree that it would be beneficial to have more detailed questions to help people through the ‘how’ with a few basic questions. The tricky thing is you’ll need a whole set of different questions for each category in the Wheel of Life. But it’s doable. Perhaps I’ll update the Action Plan template when I get the time. I think it’s a great idea.